A watershed is defined as the area of land that drains to one particular stream or water body. Each stream has its own watershed. Topography is the key element determining this area of land. The boundary of a watershed is defined by the highest elevations that surround the stream. A drop of water that falls outside of that boundary will drain to a different watershed. Watersheds come in all shapes and sizes. They cross city, county, state, and national boundaries. Large watersheds are made up of many smaller sub-watersheds. In the continental U. S., there are 2,110 watersheds large enough to be “coded” by the U. S. Geological Survey; and if Hawaii Alaska and Puerto Rico are included, there are 2,267. 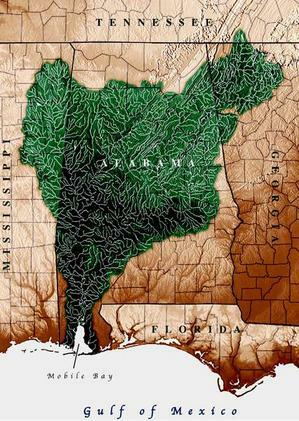 The Mobile Bay watershed covers approximately 65% of the state of Alabama and portions of Mississippi, Georgia, and Tennessee. Serving as a drainage system for 43,662 square miles, the Mobile Bay watershed is the sixth largest in the nation by area and at 62,000 cubic feet per second on average it has the fourth largest freshwater inflow on the North American continent. The Mobile Bay estuary is the coastal transition zone between the Mobile Bay Watershed and the Gulf of Mexico. The Mobile Bay and Mobile-Tensaw Delta are subject to an unusually large number of major uses with international implications, including the Tennessee-Tombigbee Waterway, the Port of Alabama, commercial fisheries, industry, tourism and recreation, and coastal development.